Following your passion is something we all aspire to do. I’m always impressed by, and envious of, people who take the risk of throwing themselves down a different path, and for head chef Larkin Cen, trading in a life of law for a world of woks cannot have been a light decision to take, but let’s all just be grateful that he did so. 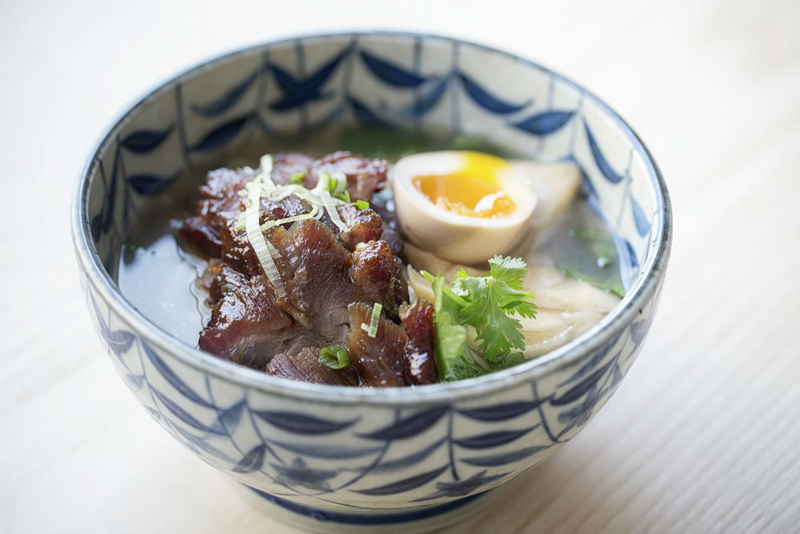 Since its opening three months ago, Wokyko has dived head first into soy-soaked glory. As has become traditional on Bristol’s microcosmic restaurant scene, Wokyko has a twin, the first – and original – restaurant sitting pretty in Whapping Wharf, focusing on fast and fun Asian street-food with a kick. Its slightly more refined younger brother resides on Park Street, proudly facing up to the Wills memorial façade, conforming to a more traditional –but no less exciting- restaurant-style service. I love a restaurant which has a small drinks menu, and having now tried five of the drinks on offer at Wokyko, I can guarantee that the majority of the entire menu is delicious, veering away from classic bottles of Tiger and little cups of sake (although be my guest, the classics are there for a reason). Seeing local distilleries on the menu is always a plus, and resident Bristolian gin Psychopomp features heavily on Wokyko’s menu. I tried it topped up with tonic and a crisp slice of Dashi pear for a refreshing aperitif. This was followed by Korean beers, lovely wine and an espresso martini (I think it was a Thursday?) – all of which were elegant, delicious, and disappeared far too quickly. The fact that I have been to this restaurant twice - rare for me in Bristol when there is so much on offer and so little in my wallet - speaks volumes; even louder when I admit that I ordered two of the same things on the menu upon my return, they were that good. My top pick here was the tenderstem broccoli with orange and peanut dressing: fresh, different, and bringing something new to a table of stir fries and ramen. Wokyko’s cuisine is basically the pan-Asian banquet of your dreams: you’ve got pillowy baos (£3.95), sticky stir fries, crispy duck pancakes (£13.95), salt and pepper squid (£6.45)… cooked right in front of your eyes and popped (depending on your chopstick skills) straight into your mouth. Let’s take a moment here to linger on the baos. Ah, bao buns. If you don’t know what these are, that’s reason in itself to go to this restaurant (or the fact that they’ve got a 15% student discount on until the end of November), because I actually could live on Wokyko’s bao buns for weeks. They could be described as a Chinese burger, but frankly I feel that would be doing them an injustice as they’re leaps and baounds (get it) more interesting than the American Whopper. Wokyko’s baos are cushiony, fluffy, soft steamed buns, stuffed with your choice of oozing pulled pork (and peanut powder?! ), tender hoisin duck, crispy fried Korean chicken & kimchi, marinated aubergine & pickled daikon, or Tiger prawn & shrimp. Personally I’d stick to the former three – I never understand why you’d want mayo on Asian food? – but I got my fish fix from the sharing starters anyway: their almond tiger prawn toasts (£6.95) are sizzlingly crunchy, and even better with the accompanying chilli vinegar dip. The thing about pan-Asian food is that you can never seem to get enough of it. Whether it’s sushi, noodles, or your local Chinese takeaway, we all seem to have the capability to reach that bit deeper in order to stuff our faces with spicy, slurping goodness; it’s addictive. That little speech was written with the sole purpose of defending myself against the mains that were subsequently ordered - after the baos, the sharing plates, and a mountain of shrimp crackers… but heck, they were worth it. 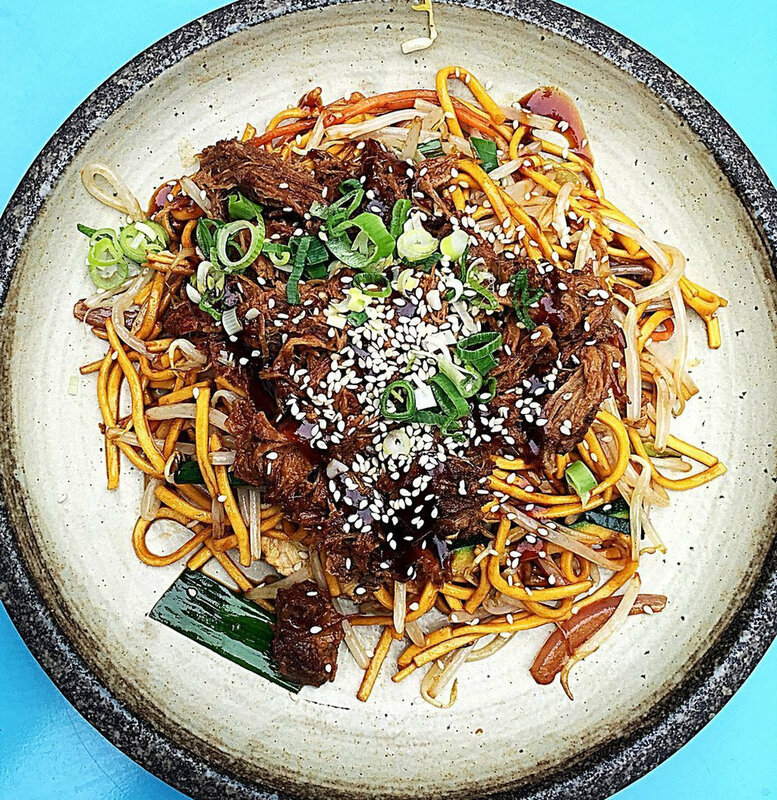 While we were out on a splash-the-cash kind of evening, if you’re looking to minimise costs and pick one plate that’ll fill your boots and send you skipping down Park Street – look no further than the ginormous plate of Chow Mein, piled with pulled pork and topped off with handfuls of spring onions and fresh chilli. This could keep me going for days. It was actually a bit too good, and left the Ox cheek ramen wilting a little in its wake. The in-house chilli oil they served with that bowl had much more flavour than the slightly lacking stock.